Tourists come here to see and to learn. But the victims came here scared and blind-folded, to suffer, and in most cases, to die. 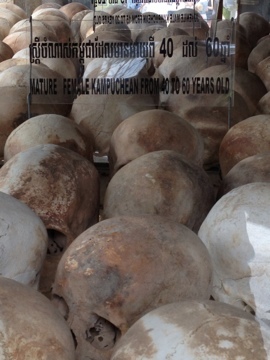 The brochure reads “The Choeung Ek Genocidal Center/Audio Tour of The Killing Fields.” It explains that Choeung Ek is the most well known of more than 300 killing fields throughout Cambodia. In the Cambodian genocide of 1975-1979, approximately 1.7 million people lost their lives (21% of the country’s population), according to yale.edu/cpg. The Khmer Rouge regime headed by Pol Pot combined extremist ideology with ethnic animosity and a diabolical disregard for human life to produce repression, misery, and murder on a massive scale. Reading this background information is necessary to even begin to comprehend the magnitude and barbarity of what happened. It does not prepare you though for what you feel when walking on the land where this took place. It is intensely humbling, and listening to personal audio accounts of survivors brings the human component to the surface chillingly and poignantly. Visitors move in silence, every mind drifting back to imagine this place in another time. One huge tree with a sprawling tangle of branches had once been filled with speakers at night, blaring loud music to drown out the moans of people being murdered. 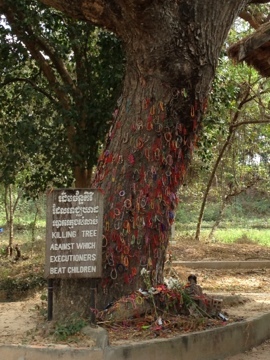 Another strong tree stands nearby, the trunk covered in hundreds of small colorful bracelets. This tree is where babies and small children were killed in unspeakable ways. 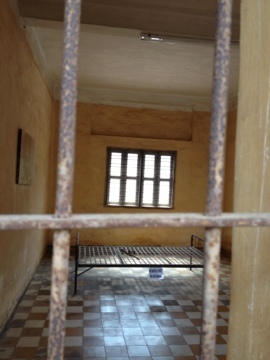 To get the fuller picture of what evil happened under Pol Pot, I also visited Tuol Sleng Museum. This torture location was known as S-21 and was converted from a high school to a secret prison and torture chamber in 1975. On the concrete premises, black and white passport style photographs of men and women are posted like a never-ending mosaic, eyes of the dead staring back at you before their torture and death. Room after room appears barren, cold and empty, save for a few items. A stark metal bed frame sits in the center, often with torture devices nearby. Since I don’t believe the mind of rational man can truly imagine what went on within these walls, museum curators remove all doubt. A single enlarged black and white photograph hangs on the wall, showing the gruesome remains of a victim after torture. A day of remembrance. A day of perspective. All of which I hope will last a lifetime. 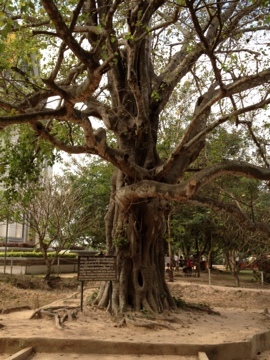 This entry was posted in Travel and tagged Asia, Cambodia, Phnom Penh, Travel. Bookmark the permalink. Why do these atrocities continue to be repeated? Have we finally learned?